It’s now hands-free mobility for Otaki’s Marcus Thompson, as he’s followed and trialled the development of the OGO, designed and created by his friend Kevin Halsall. “The idea (for the OGO) started off when I first got a chance to try a Segway, I thought if I couldn’t walk this could be a machine I could adapt into a wheelchair,” Mr Halsall said. He was thinking of his paraplegic friend Marcus and how it would be ideal for him in the off road environment. The Segway gave people mobility as they stood on “platform” and controlled their movement with body moves and by tilting the handle. This has been very popular for people with some disabilities. It was through the archery club – both men play cross country archery, when Mr Halsall first had the idea of converting the Segway into a seat activated vehicle. Mr Halsall borrowed one from Segway Wellington and straightaway started fabricating the adaptive seat. It went through many prototypes over the last three to four years, but he soon arrived at the stage where he couldn’t improve it further without getting into the guts of the electronics and works. With no other option, he bought a Segway and stripped it down and was into the inner workings, where working with his electrical partner he altered the electronics and removed the parts he didn’t need. “Now I ended up with a machine a lot easier to use and the steering controls a lot more refined,” he said. The OGO has an active moving seat control which makes it very intuitive to use. The ‘driver’ uses their core muscles all the time side to side for turning, forwards for speed and backwards to slow and brake. There’s a choice between seat controlled steering and a joy stick and control can be swapped quickly and easily just by flicking the joy stick, this locks the side-to-side movement allowing people to pick up things from the ground. 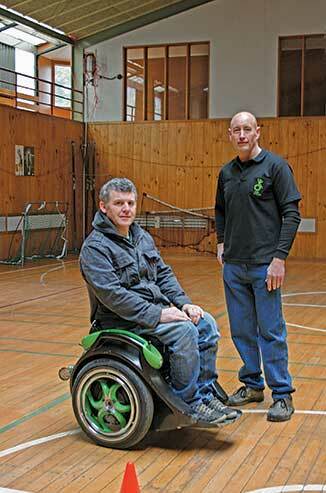 The OGO is smaller than an electric wheelchair and has a similar footprint as a wheelchair. Weighing 65 kilograms two people could easily lift it into a car. Smaller cars can be used to transport the OGO because it doesn’t require expensive modifications. Telescopic ramps could be used and the OGO will drive itself into the car! It’s easy to recharge the battery. It plugs into an ordinary wall socket and the OGO can travel 30-40 kilometres on one charge. Mr Thompson enthused over the “hole heap” of activities he could now do in the OGO. Archery –is really neat on it, beach access and inner city commute. He can also go up to the local shops and get into them and he has used it to travel to the college. The OGO was tested by several paraplegics at the college gym – weaving round cones, ball bouncing and goal shooting for basketball. They spoke of it being easy to operate and move after a brief demonstration. “Yes, there’s an element of danger (using the OGO) but that’s part of the attraction,” Mr Halsall said. Mr Halsall and the OGO are through to the finals at Palmerston North’s Innovative competition. He has already received quite a bit of interest from people overseas for the OGO.